MEXICO CITY - Diego Jair Viamontes Cotera, a receiver with Mayas, was the first player taken in the first-ever Liga de Futbol Americano Profesional/CFL draft on Monday. Cotera was selected by the Edmonton Eskimos with the first overall selection of the draft for Mexican players. Cotera posted the top time in the shuttle (4.20 seconds) in the Mexican combine Sunday. The Ottawa Redblacks, with the No. 2 selection, took Jose Carlos Maltos, a kicker who was at the B.C. Lions training camp last year. The Montreal Alouettes followed suit, taking kicker Enrique Gerardo Yenny. At No. 4, the Toronto Argonauts selected Uriel Martinez, a defensive end. The Hamilton Tiger-Cats them took another receiver at No. 5, Jose Humberto Noriega. The first offensive lineman taken was Rene Francisco Brassea, a tackle who had 30 reps in the bench press in Sunday's combine, the second-most. He went sixth overall to the Saskatchewan Roughriders. The B.C. 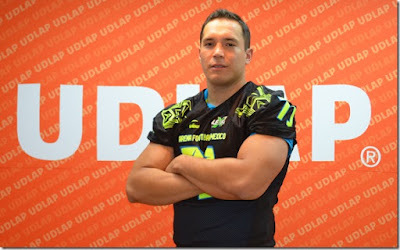 Lions selected Octavio Noe Gonzalez at No. 7, a defensive end who worked out for the New York Giants last year and the Dallas Cowboys in 2015. The Winnipeg Blue Bombers took defensive back Sergio Schiaffino with the eighth selection, then the Grey Cup-champion Calgary Stampeders completed the first round by selecting receiver Andres Saigado. The Commish was acting like this was a secret pool of talent. Two Kickers not a shocker. A couple of guys who were on pro teams radars for at least a year. plus the Regina Rams & UBC already have players from Mexico playing on their Respective U Sports football programs. Does this mean that each of the 9 CFL teams are only taking one player each. 1 round draft?